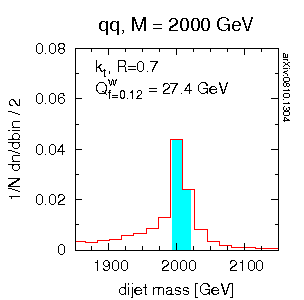 This page is intended to help visualize how the choice of jet definition impacts a dijet invariant mass reconstruction at LHC. The events were simulated with Pythia 6.4 (DWT tune) and reconstructed with FastJet 2.3. For more information, view and listen to the flash demo, or click on individual terms. This page has been tested with Firefox v2 and v3, IE7, Safari v3, Opera v9.5, Chrome 0.2.